During our travels virtually everyone we meet has heard of the Arawaks and the Caribs. James Michener’s hugely popular novel established these as the Caribbean’s native peoples and forged the dichotomy of peaceful Indian and fierce cannibal. In doing so he followed a literary tradition that traces its roots to the 16th century. Indeed, the story of the “nice Indians versus the mean Indians” has been repeated so many times that it must be correct, right? The next question always seems to be “Where did they come from?” Because most of the Bahama islands are off the east coast of Florida, people often assume that the native peoples must have come from there. They are surprised to learn that the native peoples of the Caribbean Islands (including Bahamas and Turks & Caicos) can trace their ancestry all the way to mainland South America, thousands of kilometers distant. There is virtually no evidence for any migrations from Florida into the islands. Our audiences liked the idea that the native peoples came from “Amazonia,” as it gave the islands a more exotic ambience, especially when headhunters were added in! Getting from South America to the Turks & Caicos sounded like a nearly impossible task (in fact, getting to the Turks & Caicos as recently as 30 years ago was a nearly impossible task). However, archaeologists had a simple explanation, and we will start with that. This is the (hi)story we have recounted innumerable times with complete scientific confidence. After we tell the story, we will explain why it is wrong in our next essay, in the next issue of Times of the Islands. Our final caveat: archaeologists have assigned specific names to the peoples who occupied the islands, but for our purposes it is sufficient to think of the migrants as Island Arawaks. 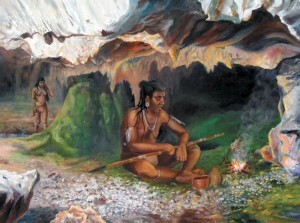 Arawak hunter eating a meal in a cave. Here’s how the story goes: Long, long ago in a faraway, exotic place, large dugout canoes that the Indians used to navigate the major inland waterways of South America (Amazon and Orinoco River drainages around 1000 BC), were adapted to open water conditions after the Arawaks reached Trinidad. From Trinidad it was a relatively short paddle to Grenada (about 130 km). Although Grenada is not visible from the mainland, there are cloud and weather patterns and bird migrations that make its presence known to the careful observer. Better still, from Grenada there are always other islands visible on the horizon to the north all the way to the Virgin Islands and Puerto Rico. It may have taken a few centuries to migrate that far (that takes us to 500 BC for those keeping score), but now they were less than 400 miles from Grand Turk (which they still didn’t know was there). After reaching Puerto Rico, the Island Arawaks settled down for nearly 1,000 years (to AD 500). It is possible that their migration stopped because they reached islands that had established populations. The Greater Antilles were colonized about 4,000 years earlier by Archaic hunter-gatherers who migrated from Central America. Did these people prevent the Island Arawaks from expanding into Hispaniola? Did the lifeline that connected the people of Puerto Rico with those of the Orinoco delta become so stretched that a period of population growth and stabilization was needed in the Lesser Antilles? These are interesting questions, but let us remind you that they are no longer relevant. The solution comes from asking a different question. The millennium in Puerto Rico wasn’t wasted. A new kind of pottery was invented, new tools became important, and the land was cleared and farmed. In sum, their adaptation to island life was nearly complete. These new and improved Island Arawaks were no longer intimidated by the Archaics and they swept through the Dominican Republic, Haiti, Jamaica, and Cuba, as completely and inevitably as the tide that washes away a child’s sand castle. The Archaics were pushed aside until they occupied nothing more than a small region at the tip of western Cuba. The Island Arawaks also began visiting the Turks & Caicos by AD 700, based on a radiocarbon date from the Coralie site on Grand Turk. The Turks & Caicos proved to be an amazing place with an abundance of sea turtles, large fishes, giant iguanas, conch, lobster, birds, and Galapagos-size tortoises. All of the food resources that had long-since been consumed on Hispaniola could be picked, plucked, trapped, or snagged with about the same effort it takes one of us to hit a buffet line. To people accustomed to a depleted ecology, the virgin environment of the Turks & Caicos was a veritable paradise. Even though food was abundant, life in the Bahama archipelago presented a new problem. There was no clay or igneous rocks for the manufacture of pottery. The Island Arawaks adapted to these islands by making crude pots from the clay-like Bahama Red Loam (“pineapple soil”) and they replaced stone with shell temper. This distinctive pottery has been used to distinguish these people, who the Spanish called Lucayans (literally “island men”), from their ancestors to the south. From the Turks & Caicos they expanded north into the rest of the Bahamas (circa AD 1000). By 1492, when the Lucayans on San Salvador discovered Columbus, who was so hopelessly lost he thought he was off the coast of Asia, the Island Arawaks had colonized all of the larger and most of the smaller islands of the Caribbean. The absence of evidence suggests that only the Cayman Islands and Bermuda (if we can include this northern isolate) were never settled. At the beginning of the 15th century archaeologists recognize that three major Cultures were operating in the islands: the Lucayans in the Bahama Archipelago, the Tainos in the Greater Antilles, and the Ignerí in the Lesser Antilles. All three are derived from the expansion of peoples from the Orinoco delta in what is today Venezuela that began around 500 BC. The Spanish conquest quickly decimated the northern islands beginning at the end of the 15th century. A separate assault began in the mid-1400s as fierce cannibals from South America invaded the Lesser Antilles. They “ate the Arawak men and married the Arawak women” as they moved north from Grenada to Guadeloupe. It was in Guadeloupe that Columbus first encountered them on his second voyage. He had, of course, been warned about these fierce “dog-faced” peoples by the northern Arawaks he encountered on his first trip, so he did his best to limit his contact with them. And they lived happily ever after. The End. Our story is like the Arawak version of a Royal Caribbean cruise itinerary for the ancient human colonization of the insular Caribbean. (Note: Carnival wouldn’t pay for product placement.) Essentially, you board the ship in Port of Spain, Trinidad and travel north with stops in Grenada, Antigua, St. Thomas (“duty-free” stop), and San Juan. Next stop is Labadee (west of Cap Haitian), but don’t mention you are in Haiti — “it’s our own private island.” You could go on to Ocho Rios, Jamaica, but we are on a mission headed north. From Haiti it’s a short hop to Grand Turk, then to Nassau, and finally Miami. At the beginning we noted that there was little evidence for contacts between Florida and the islands. The Gulf Stream presents the main barrier. Thus, although it is possible to use this current to travel from the islands to the east coast of Florida, it is extremely difficult to travel from Florida to the islands (unless that island is Ireland!) The story is so neat and logical that it all makes perfect sense. You start on one island and see another to the north. You go to that island and see another on the horizon. You go to that island and continue until all of the islands have been colonized. Hopscotch! Mr. Mencken was right. There is a clear and simple outline for the prehistoric colonization of the insular Caribbean. But it is wrong. We will explain why in our next essay. Dr. Peter T. Sinelli is an Instructor of Anthropology at the University of Central Florida, Orlando. Dr. William Keegan is Curator of Caribbean Archaeology at the Florida Museum of Natural History, University of Florida, Gainesville.